The arrival of a painting on loan from a Polish museum has become one of the biggest events in Vilnius. FOR MORE THAN A CENTURY, LITHUANIA HAS BEEN WAITing for a nearly 50-square-meter painting. 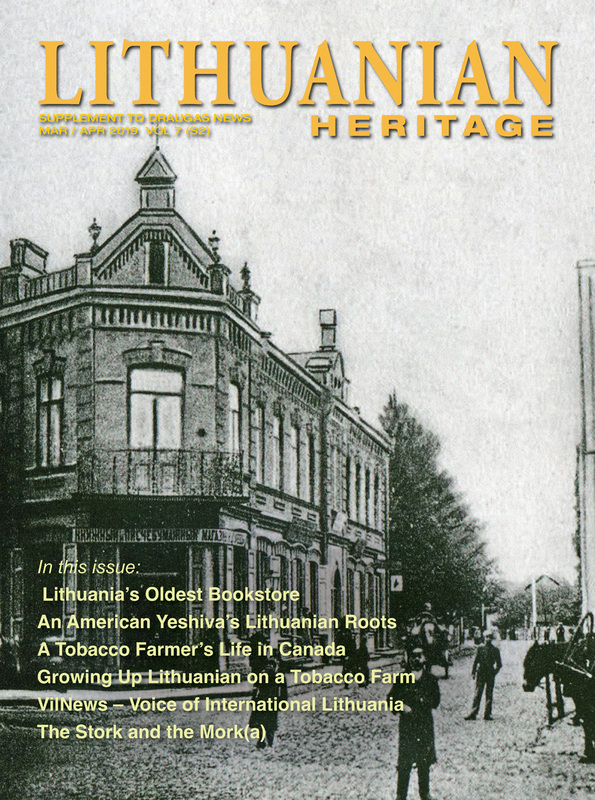 It has never been exhibited in Lithuania before, but every Lithuanian has seen copies of it in history books; some have it displayed on the walls of their flats. The painting in question is a masterpiece called “The Battle of Žalgiris” by Jan Matejko, a Polish painter of Czech origin. He completed it in 1878. Today, it is on display in the Applied Art Museum, better known to Vilnius residents as Arsenalas because it was once the arsenal of the army of the Grand Duchy of Lithuania. The painting depicts the Battle of Žalgiris, also known as the Battle of Grunwald or Tannenberg, the names of the villages, today in northern Poland, where it took place on July 15, 1410. The Lithuanian and Polish armies, led by Lithuanian Grand Duke Vytautas and Polish Kingjogaila, decisively defeated the Teutonic Knights. In modern times, Lithuanians translated the German name Grunwald (“green forest”) as Žalgiris, which explains w hy the battle has three names. The victory at Žalgiris was a turning point in relations between Lithuania and the German Teutonic Order. 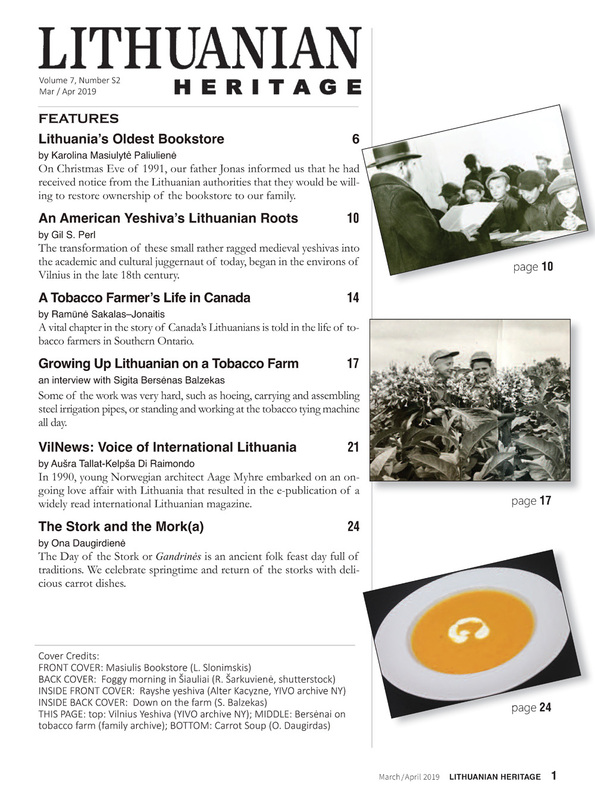 It blocked German raids on Lithuania which had lasted for two centuries. Having secure borders in the Baltic region, Vytautas the Great was able to pay more attention to the East and take over huge swaths of Russian land, including Kursk in the east and the land along the Black Sea in the south. “Every Lithuanian has seen T he Battle of Žalgiris.” It is more than just a painting. It is the memory of the nation,” says painter Aloyzas Stasiulevicius. The original masterpiece is normally housed in the National Museum in Warsaw, where long lines of eager art lovers make it one of the museum’s top attractions. Now, it is Vilnius’ turn. “After World War II, Matejko’s masterpiece left Poland just three times — for Prague, Berlin, and Moscow. I’m happy that T he Battle of Grunwald’ has arrived in Vilnius, the capital of Vytautas,” said Ferdynand Ruszczyc, director of the Polish National Museum. For its stay in Vilnius, it carries a $3 million insurance policy, but experts agree that no figure sums up the painting’s real value. The Grand Master of the Teutonic Order, Ulrich Von Jungingen, was one of those who lost their lives at the Battle of Žalgiris. The painting has a com plicated history. During W orld War II, the Nazis wanted to destroy “The Battle of Žalgiris” because it depicts Germans going down to defeat. When Poland was occupied by the Nazis, locals hid the masterpiece by burying it in the ground near Lublin. The Nazis promised one million Reichmarks for information leading to the hiding place, but to no avail. After the war, this huge painting (4.26 meters high and 9-87 meters long) was taken out of the ground and restored. 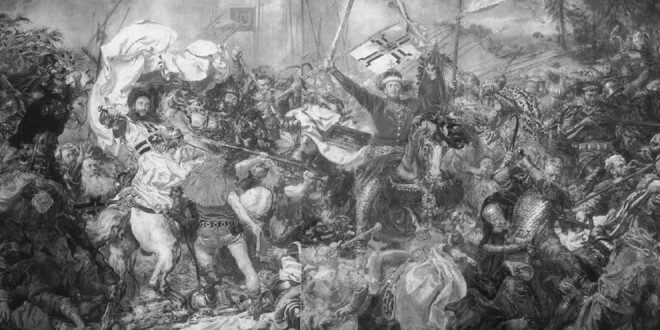 The painting portrays the climaxof the battle while the focus is on the leaders of the opposing armies. Vytautas is shown mounted on a horse and reveling in the ecstasy of his victory. Ulrich Von Jungingen, the Grand Master of the Teutonic Order, is pictured fighting through the last moments of his life. Some 90 historical figures can be identified in the painting. Some Poles might be confused by Polish King Jogaila’s position in the painting. He is painted as a small figure in the top right corner, a safe distance away from the fighting. Actually, it was exactly the case. Both leaders of the victorious allied armies were Lithuanians. Vytautas’ cousin Jogaila was ethnically Lithuanian. 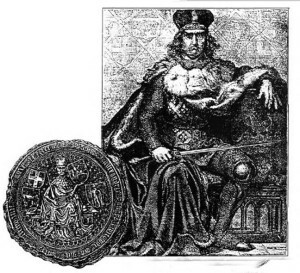 He and his descendants ruled Poland from 1386 until 1572. Jogaila spent most of the battle praying while Vytautas fought. Matejko carefully studied the 15th century and the history surrounding the battle before starting the painting, explained Romualdas Budrys, the director of the Lithuanian Museum of Art. Clothes, weapons, flags and dislocation of the troops look authentic. The battle is steeped in the history of both Lithuania and Poland. Every kid in both countries can rattle off countless details about this historic fight. The field of Grunwald is a holy place in Poland and a place of pilgrimage for school kids and adults. There is a magnificent m onument there. However, the battle is much less known in other countries. On most days, long lines form in front of the Museum of Applied Arts in Vilnius (white building) to view Matejko’s masterpiece. On the morning of the fight, Vytautas’ army comprised about 12,000 mounted knights, not including infantry forces. In Soviet times, historians were obligated to emphasize the contribution of Russians in the Lithuanian army, m entioning regiments from Smolensk (today Smolensk is part of Russia). However, Vytautas would be rather surprised to discover “Russians” in his forces. At that time Lithuania was the biggest country of Europe, three times bigger than Poland. 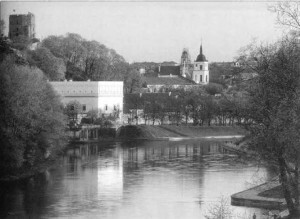 For some centuries, Smolensk was part of the Grand Duchy of Lithuania, ruled by the descendants of Gediminas. Its residents certainly did not regard themselves as “Russians. ” There were also some Tartar units in Vytautas’ army. 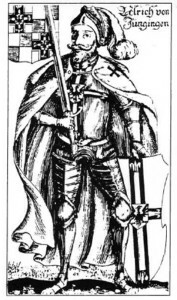 Vytautas’ ally, Jogaila, had an army that w as roughly 14,000 knights strong. A Czech mercenary regiment led by Czech national hero Jan Žižka also joined the Polish army. Meanwhile, the German Teutonic Order, led by Von Jungingen, had 27,000 knights, including regiments of French, English, and Swiss mercenaries. It was a fierce clash where swords, spears and cudgels w ere sw ung through the air. The battle lasted ten hours. Lithuanian and Polish forces routed the enemy at the end of the clay’s heavy fighting. Von Jungingen was killed. The April 14 opening ceremony for “The Battle of Žalgiris” was attended by a bevy of Lithuanian and Polish leaders, including Lithuanian President Valdas Adamkus and Polish President Aleksander Kwasniewski, as well as the Chairman of the Lithuanian Parliament Vytautas Landsbergis (named, as are all Vytautases, in honor of the victorious general in Matejko’s painting). “The arrival of this painting is a historic moment, one of the most impressive moments in the life of both our nations. It crowns the end of this millennium,” said Adamkus. 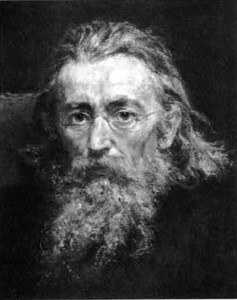 Kwasniewski recalled the circumstances in which Matejko painted his masterpiece. It was the end of the 19th century, and the LithuanianPolish Com m onw ealth had been occupied by Russia, Prussia and Austria since the end of the previous century. By this painting, Matejko predicted defeat for the occupants. “When Poland did not exist on the map of Europe, Matejko, through this painting, reminded us of one of the main events of our history. Matejko raised the hope of national rebirth,” said Kwasniewski. The common history could also serve as a call to cooperation today as well. Matejko’s painting is not alone at the museum in Vilnius. Rather, it is the centerpiece of an exhibit that has drawn from the collections of the Polish Army Museum and a spate of history museums from many cities around Lithuania. Included are authentic 15th century weapons and reconstructed flags of the Teutonic, Polish and Lithuanian army units that participated in the battle. The Teutonic Order lost 52 regimental flags after their defeat at Žalgiris. 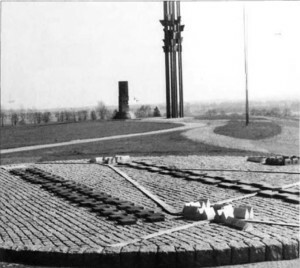 An impressive monument was built in 1960 on the battlefield in present-day Poland. Also on display is a trophy kettle drum captured by the army of the Grand Duchy of Lithuania from the Turks during a battle near Vienna in the 17th century. The exhibit has been attracting huge crowds. Buses full of school children have been arriving from all corners of Lithuania. Those who are fascinated by the Matejko masterpiece can buy a one- meter-long copy of “The Battle of Žalgiris.”. Originally the exhibit was scheduled to close on July 15, the anniversary of the battle. But the director of the Lithuanian Art Museum convinced everyone that the exhibit should be extended to August 30, in order to give more people the opportunity to view the painting. And if that isn’t enough, Lithuanians can take comfort in being rem inded of this proud day in their history every time the Kaunas “Žalgiris” basketball club plays. Named in honor of the famous battle, the team won the coveted Euroleague championship in Munich last April 22. Advertisements for the games in the local media pictured the Kaunas players on the landscape of the Matejko painting. Everyone was speaking about the “new ” Battle of Žalgiris, which the Kaunas team won.